It’s no secret that Florida is a prime location for retirement. The state offers homebuyers a huge variety of options, coastal and inland, that include intimate neighborhoods to city-sized resort communities along with endless opportunities for recreation that range from golf to tourist attractions to beautiful nature preserves. Located in the center of the state, the Ocala Area possesses a unique set of attributes and attractions, combined with an ideal, central location that make it a nearly perfect place to call home. Ocala’s roots go back to the mid-19th century when it was an important hub of commerce in the center of the state. Agriculture, namely the state’s famous citrus farms, dominated the landscape. With an average of 233 sunny days a year (they don’t call it the Sunshine State for nothing) it is easy to see how citrus farming flourished. This prosperity allowed the city to grow and establish itself as one of Florida’s major inland cities. Moving forward to the mid-20th century, the city became internationally famous for its horse stables and associated equine industries so much so that the city is often referred to as the Horse Capital of the World. There are more than 1,200 horse farms encompassing some 77,000 acres in Ocala and surrounding Marion County. Legendary racehorse ‘Affirmed’, the most recent Triple Crown winner before ‘American Pharaoh’ in 2015, came from Harbor View Farm, which is located in the area. Today, Horses in the Sun (known as H.I.T.S), a dressage and jumper event, brings thousands of visitors to the area. Horse lovers can also visit Ocala Breeders Sales to see famous owners and trainers bidding on new horses for their stables. In addition to the major annual shows, area residents can take horseback riding lessons or arrange for a scenic trail ride. For entertainment and attractions, Ocala and the surrounding area have much to offer. 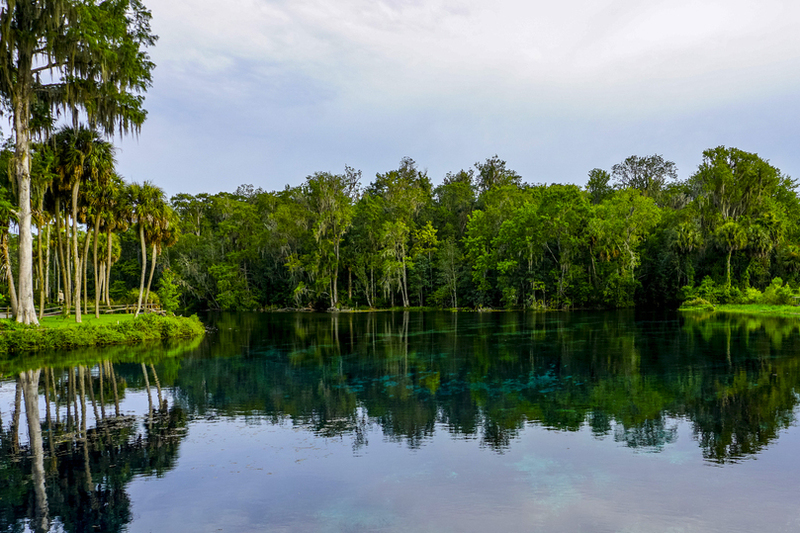 Just outside of Ocala, retirees will find that the Silver Springs State Park is a perfect option for when the grandkids come to visit. This magnificent outdoor attraction is famous for its glass-bottomed boats that offer underwater views of turtles, fish, alligators, and other wildlife creatures. The park also has rides, a petting zoo, animal exhibits, and concerts. Ocala also offers several regional museums and performance venues like The Appleton Museum of Art and the Ocala Civic Center. The Ocala National Forest, which covers about 383,000 acres of lush pine, lakes, rivers, and regional wildlife, makes for a great outdoor adventure close to home and provides plenty of opportunities for hiking, fishing, camping, boating, cycling, and other outdoor recreational activities. On Top of the World is far and away the largest community catering to the needs of active adults in the area. It boasts an impressive 10,000 finely crafted homes and a lineup of amenities that rival that of a lavish resort. Golfers have plenty to explore with three par-72, 18-hole courses, while fitness and amenity centers, meeting places, performance venues, and a shopping center appeal to all kinds of active adults. Trilogy at Ocala Preserve has generated a lot of buzz as one of the area’s newest communities. Shea Homes currently plans for 1,800 energy-efficient, single-family homes with amenities like a golf course, state-of-the-art fitness center, spa and salon, full-service restaurant and bar, and 22 miles of walking and biking trails. Homeowners at Spruce Creek Preserve by Del Webb enjoy a smaller, more intimate community surrounded on three sides by Ross Prairie State Forest. Although the community is smaller than others in the area, residents still have access to a well-curated set of amenities and thoughtful neighborhood design that Del Webb is famous for. Ocala, with incredible nature to explore, an unmatched lifestyle, and renowned 55+ communities, continues to be one of the most desirable retirement locations in all of Florida.